The Forbidden Wish is one of those books that completely enchanted me. I have always like Jessica Khoury’s writing style but I have to say that this was one of my favorite books from her. It was so easy to be completely absorbed into Aladdin and Zahra’s world. This has to be one of the best retellings I have ever read and The Forbidden Wish has an eternal place on my favorites shelf. There are different types of World Building. You can have large worlds with many nations and places and then you have smaller worlds with extremely lush details. I felt like this was more on the smaller with very lush details. We spend a lot of time in the main city and palace but every piece that is a part of it really brings everything to life. I felt completely engrossed in this setting, people and culture of the book. Very well done. The lore of the Jinni is taken from the Arabian Mythology but Jessica Khoury really makes it her own. She flushes out the tales and gives you such a great mental visual of them. I loved that Zahra as the narrator is telling the story as though she is speaking to her former master. It was a great way to really make you feel involved in the story as though you are that past person. Such a unique way to write it. Zahra is a great character herself. She is strong and fierce and holds her secrets close to her heart. She does not want to open up to anyone because she finds it difficult to trust. She has many good reasons for this but as the story progresses we really start to see different sides of her. It’s like you have to crack through her shell to get to the light inside her which is where Aladdin comes in. Well, Aladdin is quite the charming devil. He is this perfect mix of clever and sly but also has an innocence to him. He’s the thief with the heart of gold of course. I absolutely loved this portrayal of him and found myself swooning. I’ve read many different Aladdin retellings and I can’t say that’s always been the case for me. I love this book so much I want to reread it already. The Forbidden Wish transported me into a magical world and stole my heart. I have enjoyed this author's other books - I need to check this one out! I've only ever read Khoury's debut novel, but I've been meaning to check out the rest of her stuff! 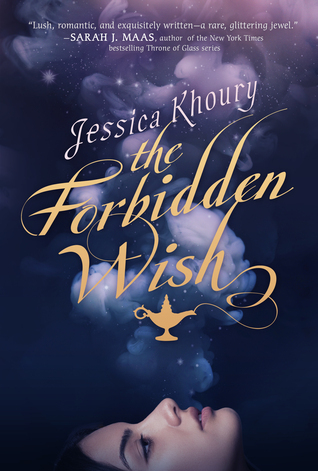 The Forbidden Wish intrigues me because it's inspired by Aladdin, and I was obsessed with Aladdin as a kid. Definitely going to try to check this out this year!